TAMPA, Fla. -- How does earth’s biggest fish dine on the tiniest marine critters? New research reveals how whale sharks filter feed in the wild and links their feeding anatomy, behavior and ecology as never before. The study, recently published in the journal Zoology, is the most comprehensive to date on the unique feeding system that sets whale sharks apart from all other fishes. This research suggests that whale sharks may filter their food through a process also used in human-engineered machinery, and that this delicate filtration system is likely vulnerable to oil spills and other environmental threats. To understand this complex feeding system, scientists from the United States and Mexico combined detailed anatomical research with long-running surveys of whale shark feeding behavior and ecology in the wild. Understanding how whale sharks feed is a key step toward conserving the species, which is deemed vulnerable by the International Union for Conservation of Nature. Resource managers can use this knowledge to maintain and protect habitats these animals depend on for survival. The study is titled “Feeding anatomy, filter-feeding rate, and diet of whale sharks Rhincodon typus during surface ram filter feeding off the Yucatan Peninsula, Mexico.” The research team included investigators from the University of South Florida, Mote Marine Laboratory, the Georgia Aquarium, Proyecto Domino, Mexico’s Comision Nacional de Areas Naturales Protegidas and the University of California, Irvine. The team studied whale sharks as the animals gathered en masse to dine on plankton blooms in the Gulf of Mexico and Caribbean Sea waters near Isla Holbox, Mexico, to feed from May to September. Ongoing research by Proyecto Domino has shown that as many as 1,400 whale sharks may visit the area annually. The aggregation of sharks -- the largest known in the world -- gave the researchers a rare opportunity for comprehensive studies of the elusive species, which spends most of its time traveling long distances underwater. The researchers found that, for most of the day, the whale sharks swam at or near the surface, angled upward about 13 degrees with their open mouths submerged or peeking above water. Whale sharks sought plankton patches dominated by tiny crustaceans, called sergestid shrimp and calanoid copepods, along with predatory worms called chaetognaths. The whale sharks swam to “ram” water and food through the filtering pads covering the entrance to their throats -- a process called ram feeding. Water passes through while large enough food particles are caught and carried to the throat in a process researchers are still describing. The study found that one whale shark could filter the water in an Olympic swimming pool in 4 hours -- that’s about 162,201 gallons per hour, Motta said. The team also took photographs and made detailed measurements to describe the 20 filter-feeding pads and surrounding structures in the mouths of whale sharks that live at the Georgia Aquarium in Atlanta. They also took tissue samples from deceased whale sharks. Of the more than 400 known shark species, only three are filter feeders: basking sharks, megamouth sharks and whale sharks, Motta said. Basking and megamouth sharks collect food with “gill rakers,” which act like bristly or spongy turn-styles that are stuck in place trapping food but letting water pass to the gills. Whale sharks have finer filters, more like the ones in an air conditioner, with broad mesh pads full of tiny, irregularly-shaped pores. Each pore on whale sharks’ filter pads is about 1.2 mm wide, said the researchers who painstakingly measured nearly 10,000 individual pores using macro photography. Until now, the most detailed study of whale sharks’ filter feeding anatomy was a paper in 1941. The current study adds much greater detail – including measurements of the tiny pores in the filter pads. Cross-flow filtration is a process used by commercial beverage manufacturers to filter liquids. 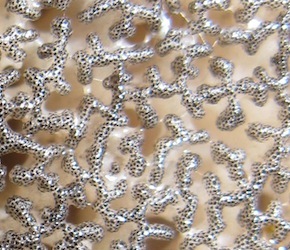 The liquid moves through a slanted filter and debris is carried to the back, rather than immediately entering -- and quickly clogging -- the filter pores. Use of cross-flow filtration by whale sharks might account for certain behaviors in the wild -- notably that whale sharks capture particles that would seem to be too tiny for their filters and that they don’t need to clean their filters by “coughing” as often as expected without cross-flow filtration. But environmental contaminants may block these fine filters, the researchers said. “We don’t know for certain, but we suspect oil would clog the filters because all the water that these animals breathe must pass through those filters before reaching the gills,” said Robert Hueter, Director of Mote’s Center for Shark Research and leader of Mote’s field studies on whale sharks. Scientists are not sure how the Deepwater Horizon oil spill affected whale sharks, which are known to inhabit the northern Gulf of Mexico. Hueter and other Mote scientists will soon begin a two-year study assessing the spill’s effects on whale sharks and other large sharks. The current feeding research was based on sharks in oil-free waters of the southern Gulf. To relate whale sharks’ filter feeding anatomy to their behavior in the ocean, scientists monitored and took videos of 33 whale sharks from 2006-2008 in waters off Mexico’s Yucatan Peninsula. They estimated how much time sharks spent skimming the surface for plankton, how fast they moved and how much water entered their mouths. They also collected plankton near the sharks to determine its size, species and nutrition content. Mote scientists, who led the field portion of the research, have studied whale sharks in Mexican waters since 2003 to reveal local feeding hotspots, monitor feeding behaviors and record the animals’ movements and diving behaviors by attaching external tags, including satellite-linked tags. Studying whale sharks’ daily habits is crucial for determining how often they feed and what they eat. The team combined field observations with anatomy to make the first mathematical model of how fluid flows into whale sharks’ mouths, carrying food to their filter pads. With this model they estimated that, at their study site, a whale shark about 20 feet long filters 614,000 liters per hour of water and eats 6,721 calories a day. Future studies of whale shark feeding can build upon the methods pioneered here, the researchers say. “It’s important that our project covered whale shark feeding from every angle, from structure and morphology through behavior and ecology,” Hueter said. “Often you see anatomy papers with beautiful descriptions of morphology and suggestions about its function. We looked not only at function, but also to the ecological level and the role that feeding plays in these animals’ conservation needs. To build upon this study, the researchers emphasize the need for studies on how whale sharks feed over longer periods of time, such as during their deep dives to more than 6,000 feet deep and in areas with more food or less available food. Understanding this bigger picture will help scientists link nutrition needs with conservation and will help public display and education facilities provide whale sharks with the healthiest possible diet. “This paper represents a big step forward in our understanding of one of the largest and most enigmatic animals in the sea,” said Alistair Dove, senior scientist at the Georgia Aquarium.